Our handy address search tool, which previously only featured on the 1901 and 1911 UK censuses, the 1939 Register and Australia Electoral Rolls, is now available across all British censuses from 1841 to 1911. This allows you to find out who was living at a particular address at the time each census was taken. Use this quick guide to get the most out of census address searches. To start using the address search tool, head to any of our UK census records sets from 1841 to 1911. You can access these via the A-Z of records. To search for an address rather than a person, select 'Address' from the 'Person/Address' toggle switch at the top of the search screen. You will now be able to search by street, parish or town, county and/or country. The 'parish or town' search field will return results for civil parishes, registration districts, towns, villages, boroughs or sub-districts. As you type a location into the the 'parish or town', 'county' or 'country' search fields, our clever predictive system will suggest matches for your search. So for example, if you were to start typing in 'Weston' into the 'parish or town' field, you'll see a range of suggestions for places with 'Weston' at the start of their name. 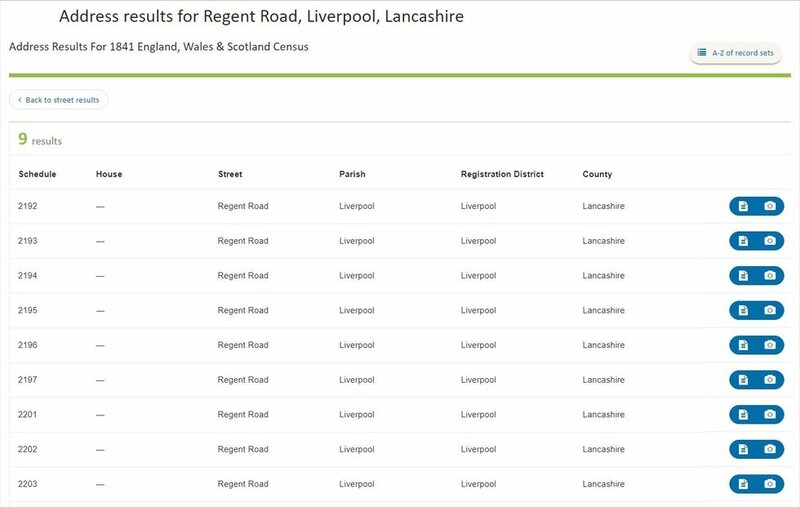 If you were more specific, and typed 'Regent Road' into the 'street' search field, then that would bring up results for every 'Regent Road' in the census. Then, if you click on any of the roads on your results, you will be taken to a list of all the houses on that particular road or street. From there, you simply select the house you're interested in, and you will be taken to a transcription of the census record for that property. The address search tool also recognises abbreviations ('St' for 'Street', 'Rd' for 'Road' etc). As usual with our search forms, none of the fields are required. Therefore you can easily find all instances of a particular road name we have if you are not sure of any of the other historical information. We hope this tool helps you get even further with your family (or house) history research.